Arsène Wenger insists speculation over his future with the football club Arsenal will never distract him from rebuilding the troubled Gunners. Arsenal chief executive Ivan Gazidis moved to quash that speculation on Tuesday when he issued a vote of confidence in Wenger. But the Frenchman’s stock briefly looked like plummeting even further when League Two minnows Shrewsbury took a 1-0 lead in the League Cup third round in front of a stunned, well-below-capacity crowd at the Emirates Stadium. James Collins’ header in the 16th minute threatened to make Wenger pay for his gamble of fielding a youthful starting line-up. England Under-21 defender Kieran Gibbs levelled before the break with his first senior goal before teenage winger Alex Oxlade-Chamberlain fired in a 25-yard effort on the hour and Israel midfielder Yossi Benayoun, on loan from Chelsea, wrapped things up late on. Despite the criticism, Wenger has no intentions of letting anything deflect him from his job. Asked if he should consider bringing in a defensive expert—such as former player Martin Keown—to help shore up the backline, he said: “I have just completed 30 years of coaching. I don’t want to answer this kind of question." 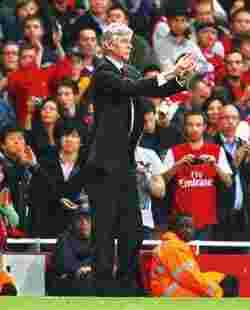 On his “vote of confidence" from the board, Wenger added: “I am not bothered at all by this speculation. I am completely focused on doing well. I can understand that people are unhappy and criticize, but you know as well as I know, people are quick to go overboard. “I accept critics and I do not say it doesn’t matter that people criticize us, and like anybody else, I prefer it when they say I am good. When we do well, we take all the plaudits, so we have to take all the blame when it doesn’t go as well. When it goes well, we must not completely believe what people say. When it does not go as well, we must not completely believe it. “I have just managed 14 years at this club and I have kept them 14 years in the Champions League and I hope it lasts another 14 years,"said Wenger.